Systems and methods consistent with the principles of the invention may provide a reasonable surfer model that indicates that when a surfer accesses a document with a set of links, the surfer will follow some of the links with higher probability than others. This reasonable surfer model reflects the fact that not all of the links associated with a document are equally likely to be followed. Examples of unlikely followed links may include “Terms of Service” links, banner advertisements, and links unrelated to the document. The rank of a page can be interpreted as the probability that a surfer will be at the page after following a large number of forward links. The constant Î± in the formula is interpreted as the probability that the web surfer will jump randomly to any web page instead of following a forward link. Biometric Parameters as a Ranking Signal in Google Search Results? Do you search through Google on your phone? How do you know whether or not Google is watching you as you do and keeps on eye on whether or not you like the results you receive during your searches? Could Satisfaction with search results be a ranking signal that Google may use now, or in the future? Are they keeping an eye on Biometric Parameters while you search, watching you through your phone’s camera? Author Bill SlawskiPosted on 04/18/2016 08/22/2018 Categories Search Engine Optimization (SEO)90 Comments on Biometric Parameters as a Ranking Signal in Google Search Results? Visitors to a website may want to perform certain actions related to Entities (specific places or people or things) that are displayed to them on the Web. For example, at a page for a restaurant (an entity), a person viewing the site may want to create a reservation or get driving directions to the restaurant from their current location. Doing those things may require a person to take a number of steps, such as selecting the name of the restaurant and copying it, pasting that information into a search box, and submitting it as a search query, selecting the site from search results, determining if making a reservation is possible on the site, and then providing information necessary to make a reservation; getting driving directions may also require multiple steps. Using a touch screen device may potentially be even more difficult because the site would possibly then be limited to touch input. 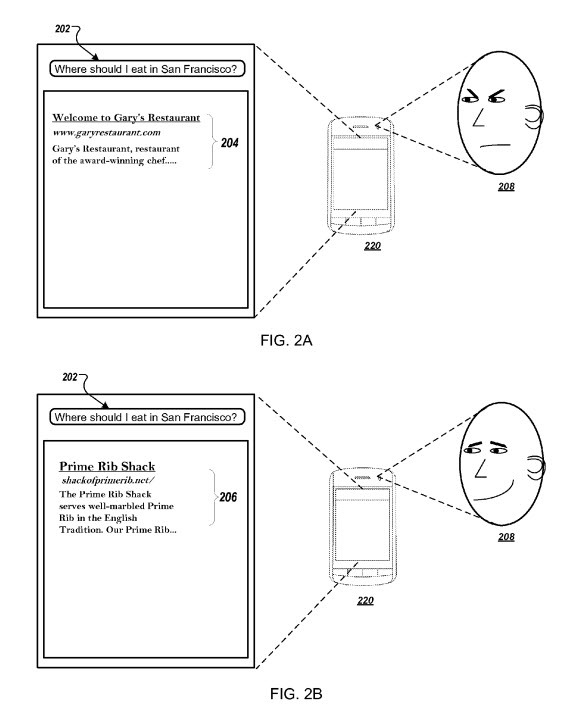 A patent granted to Google this week describes a way to easily identify an entity such as a restaurant on a touch device, and select it online and take some action associated with that entity based upon the context of a site the entity is found upon. Actions such as booking a reservation at a restaurant found on a website, or procuring driving directions to that site, or other actions could be easily selected by the user of a site.